This beautiful hotel in central Rome is a triumph of traditional design and Baroque style, with 179 rooms and suites. All rooms feature a neat harmony of classical and contemporary elements - triumph of colour all round, with a bold palette of ochre and red. 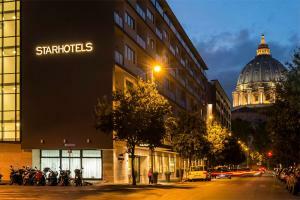 The hotel is close to the Vatican and select rooms enjoy dramatic views of St Peter's Dome. The Sistine Chapel is just steps away.